We Macy balloons have always stood for peace and plenty of fun for all. We were a weaving and bobbing symbol of democracy at play. We figured in a parade devoted to laughter and shenanigans. Fear never marched in our ranks. there wasn’t a goosestep or a gun in the whole shebang. The 2,000,000 people who came to enjoy the show were peace lovers too. But now we’ve a war to win and we’ve enlisted, to help make the world safe for future parades full of merriment and good will. We are turning ourselves over, body and soul, with no strings attached, to the New York City Salvage Committee. Destined for the rubber scrap pile, we will perhaps find our way into tires for tanks, or maybe life rafts. Wherever we’re most needed, we’ll be glad to serve our country– though we can’t help wishing we could float over Hirohito’s palatial shack, and frighten him out of his kimono. We’d like to act as a barrage balloons, around New York or London. But it’s up to the armed forces. What they say goes, And whatever assignment we draw, we’ll swell with prid (helium or no helium) knowing that we’re going to help deflate Hitler and his chums. 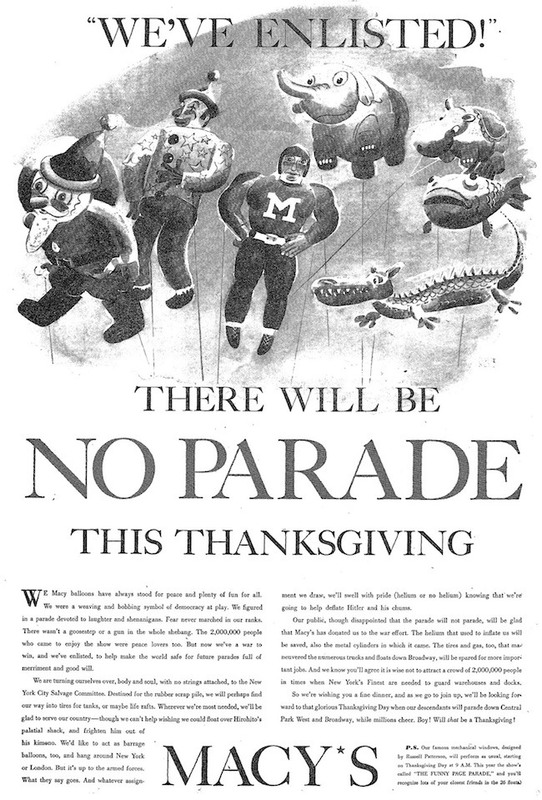 Our public, though disappointed that the parade will not parade, will be glad that Macy’s has donated us to the war effort. The helium that used to inflate us will be saved, also the metal cylinders in wich it came. The tires and gas, too,, that maneuvered the numerous trucks and floats down Broadway, weill be spared for more important jobs. And we know you’ll agree it is wise not to attract a crowd of 2,000,000 people in time when New York’s Finest are needed to guard warehouses and docks. So we’re wish you a fine dinner, and as we go join up, we’ll be looking foward to that glorious thanksgiving Day when our descendants will parade down Central Park West and Broadway, while millions cheer. Boy! with that be a Thanksgiving! P.S. Our famous mechanical windows, designed by r\Russell Patterson, will perform as usual starggin on Thanksgiving Day at 9 A.M. This year the show’s called “THE FUNNY PAGE PARADE.” and you’ll recognize lots of your closest friends in the 26 floats.